Edd and his family have lived in the village since 2007, Edd works as a Director of research and development for a local company. Sarah is a nursery assistant for the Ladybirds toddler and playgroup. 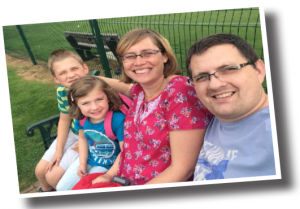 They have 2 children Sam and Evie-Grace and they all attend The Salvation Army , Church in Impington lane where Edd manages the finances of the church and village charity shop. Both Sam and Evie-Grace attend local schools and Sarah works for The Ladybird toddler and playgroup. Edd is also an avid brass player and has played in many Salvation Army and local bands and recently with a group of local musicians playing Christmas carols in the pubs of Histon. Edd has been involved in many village projects and events, as well as a trustee for Histon & Impington Community (HICOM) and Friends of Histon & Impington Recreation and is passionate about making our communities one everyone wants to live in.